"It wreaks emotional havoc . 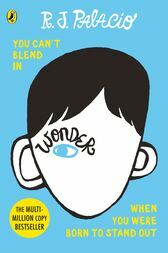 . . To finish it with a firm resolve to be a better person - well, you can't ask much more of any book than that"
R. J. Palacio lives in Brooklyn, NY with her husband, two sons and two dogs (Bear and Beau). Her debut novel, Wonder, has been on the New York Times bestseller list since March, 2012, and has sold over 14 million copies worldwide. The book’s message of kindness has inspired the Choose Kind movement, and has been embraced by readers, young and old, around the world. this book it so wonderful because it has so many different points of views in it and the characters really out due themselves and it all ties together so beautiful and its just so awesome.